Studio windows pull customers into photo studio. Clever window displays can influence your customers too. 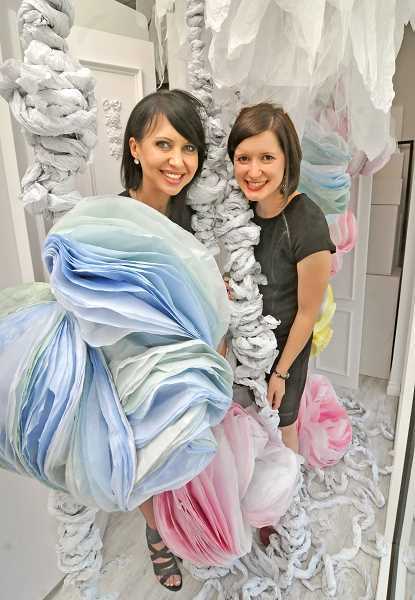 Bonnie Johnson and Tanya Rochat know the meaning and true value of the art of collaboration. Both women are artistic entrepreneurs: Johnson has an interior design background and Rochat is a portrait photographer who helps people see their hidden beauty. They happen to live in the same Lake Oswego neighborhood and were delighted to discover they had complementary perspectives of beauty, curiosity, courage and humor. changes the displays in the windows, much to the pleasure of customers and those walking by. And people notice. Rochat says her portrait photography changes how clients view themselves. "It doesn't matter how old or large you think you are," she said. "My job as a portrait photographer is to take the most beautiful photograph you have ever seen of yourself so that you can cherish this for the rest of your life." Drawing upon her talents as a fashion designer, fashion photographer, plus expertise in graphic design and illustration, her portraits capture the stories of the people, letting their souls shine through. Rochat offered to photograph Johnson which led to the women talking about Rochat's studio, what it could become and Rochat's dreams for it. Johnson offered some innovative suggestions and the creative sparks flew between the two. The result: an imaginative giant floral world to fill the photo studio's front windows. Johnson designed tissue flowers, hand dying 1,680 sheets of tissue paper with pink, fuschia, purple, navy, light yellow, goldenrod and gray fabric dyes — requiring an untold number of hours and about 100 feet of wire. She hung the flowers on chains which she wrapped to become tissue paper vines. "They were designed to reflect the beautiful photography that is created within the studio's space," Johnson said. "Bonnie's imaginative display welcomes new clients into the studio and gives them a hint of the stunning photography that takes place within," said Rochat. Both women agree that well designed windows can be a powerful marketing tool for any business. "Great windows can bring joy and cause laughter," said Johnson. "They tell a story and are meant to cause the viewer to pause and then come in." Rochat said that when she was working with United Colors of Benetton, shoppers were compelled to come into the store to buy the specific color shirt featured in the window. "They didn't want their favorite color — they wanted the color that was in the window," she said. Johnson says she aims to have window displays become as iconic to Lake Oswego as the Chamber of Commerce's flower baskets which grace the streets spring through fall. The windows at Chocolates by Bernard and Tanya Rochat Portrait are just the beginning. "Ultimately the window display is about adding a unique experience to those who patronize Lake Oswego shops," Johnson said. "Perhaps it will stir new conversations, inspire big ideas, just add beauty or tempt you to get your portrait taken. In any case we have enhanced and enlivened our community and for that we are very grateful." To view the floral garden at Tanya Rochat Portrait visit 16144 Boones Ferry Road through mid-September. To learn more about her portraits including senior pictures, visit tanyarochat.com. To learn more about Johnson' window display design visit sprucesteel.com. She changes the window display at Chocolates by Bernard each month, so view them frequently.